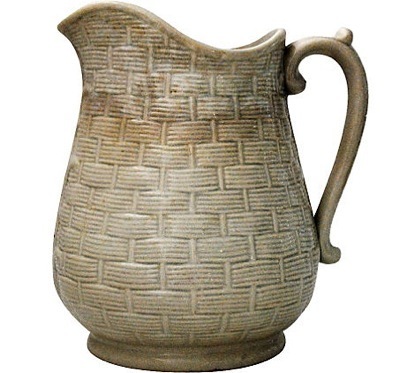 Not much is known about this large white ironstone water jug with impressed basket weave design and pearlware glaze. 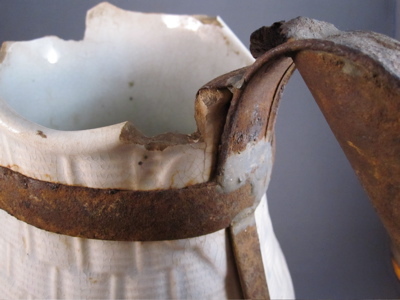 It was found at a bottle dig site in Harper’s Ferry, NY, and remarkably, the tin handle, buried in the ground for dozens of years, remained mostly intact. 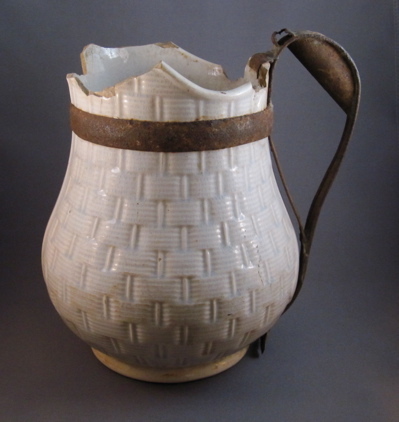 The neck and spout of the jug were not so lucky, as much has broken off, revealing an asymmetrical jagged edge. 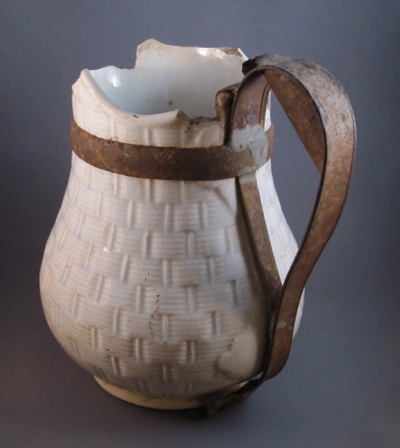 This scrappy jug was made in England in the mid to late 19th century, and measures 9-1/4″ hight to top of handle and is 7-1/2″ at its widest point. 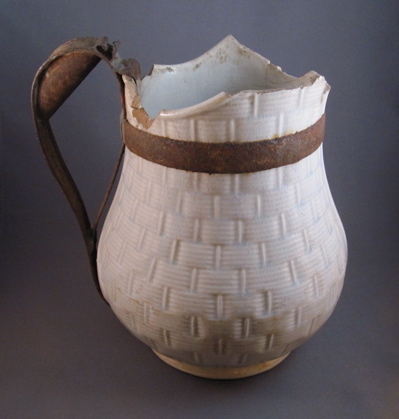 This intact jug shows what the original handle and top edge of my jug would have looked like before the tumble. 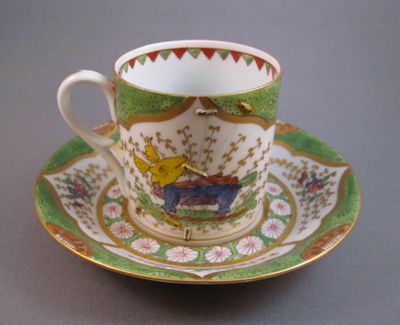 This fine, lightweight porcelain cup & saucer set was made in Dresden, Germany in the late 18th century. 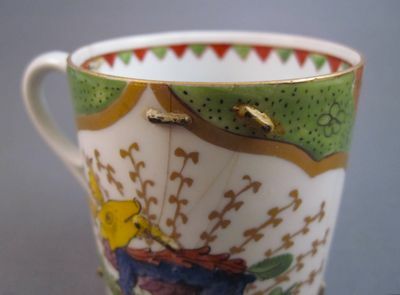 It is hand decorated with polychrome enamels and gold highlights in the wonderfully stylized “Dragons in Compartments” pattern, also known as the “Bengal Tiger”, “Kylin” or “Bishop Sumner” pattern . 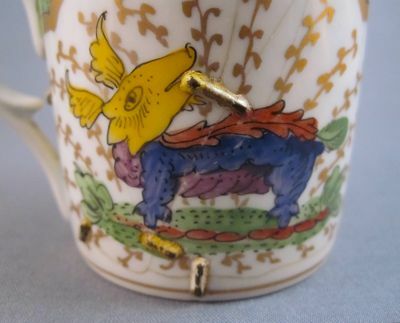 At one point in its early life, someone sipping an expresso was so scared by the fierce dragons depicted on the sides that it was dropped and broke into 3 pieces. 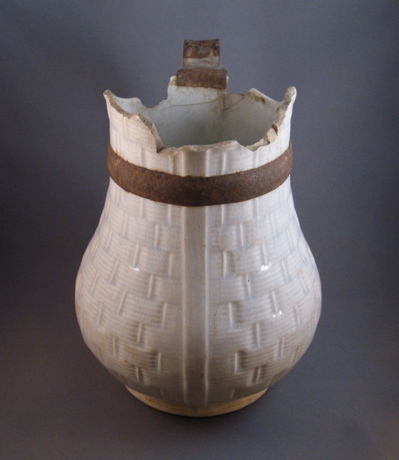 Gathering the broken shards and somehow finding the strength to face the fierce fire breathing monsters again, the brave soul brought the broken cup to a tinker, who was able to restore it, using metal staples. 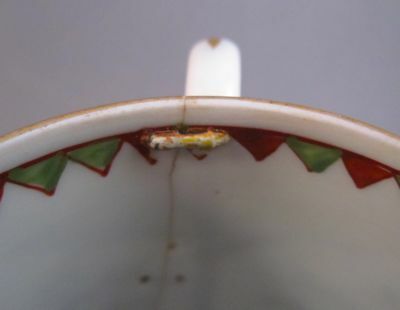 The intact saucer measures 4-1/2″ in diameter and I would have much preferred if it too were repaired with staples! This li’l dragon seems to be smoking a stogie, which is actually a metal staple keeping him in one piece. 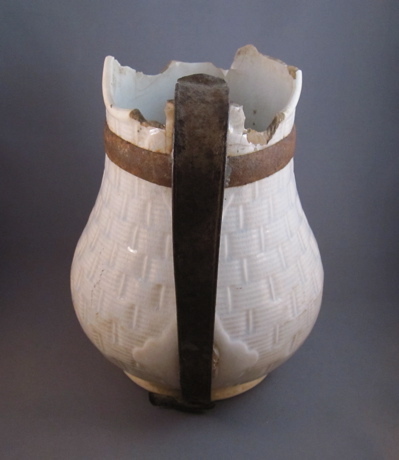 There are 8 tiny staples on the outside and one on the inside, once overpainted to mask the repair. 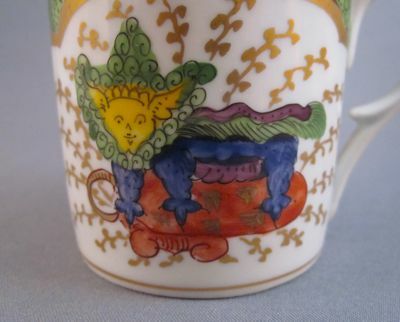 Cup measures 2″ in diameter and stands 2″ high. Isn’t this the cutest, non-threatening dragon you have ever seen? To me it looks more like a super-hero kitten sporting a purple cape with green fringe. 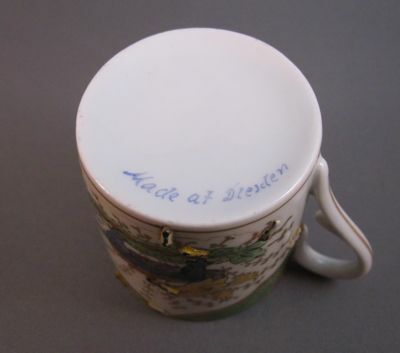 Both the cup and saucer are mark on the bottom in blue “Made at Dresden”.